Tesla Motors said Tuesday it sold 6,900 Model S electric cars in the last three months of 2013 — 20 percent above the previous forecast. On news that the company delivered 6,900 Model S cars in the fourth quarter, Tesla’s shares spiked 15.74 % in regular trading, and another 3.56 % in after-hours trading. 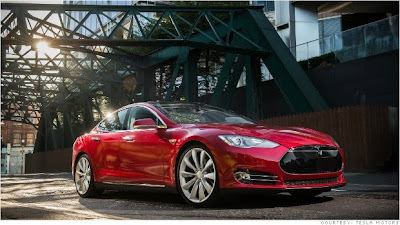 Palo Alto, Calif.-based Tesla had forecast just under 6,000 Model S sales in the fourth quarter. Tesla delivered about 22,400 Model S vehicles for all of 2013. Diarmuid O'Connell, vice president of development for Tesla, said demand remains strong for the vehicle, but the company continues to wage battles with franchised auto dealers in different states. Tesla sells its vehicles directly to consumers, not using franchised dealers, which has drawn attacks from many of the dealer groups around the country. Mr. O'Connell said Tesla is now fighting new political battles in Ohio and New Jersey, and expects a battle in Georgia. Last year, Tesla waged fights in Texas, Virginia, North Carolina and New York. "We have had some success when we have been able to shed some light on the issue," he said. "But dealers in some states have not changed their point of view" on Tesla's sales system. Tesla said it is still on target to deliver the first Model X sport-utility vehicle by the end of the year, but the company didn't give any other updates on the vehicle. Currently, the Model S is its only model.